With Punxsutawney Phils predicting an early spring, and Long Island’s recent seasonally warm weather, the timing is perfect to plan how you’ll spend your 2019 outdoor living season. If you’d like a bona fide expert’s advice on that, an internationally-recognized authority on products useful and enjoyable, we think a key panel member of ABC’s Shark Tank should do the trick. Indeed. Best Hot Tubs can boast selling one of our Bullfrog Spas to Barbara Corcoran, of ABC’s popular program, Shark Tank. With approximately a half-million page-likes on her Facebook page, https://www.facebook.com/TheBarbaraCorcoran/, and three-quarters-of-a-million Twitter followers, @BarbaraCorcoran, the entrepreneur’s followers know she’s brilliant at recognizing a great deal. Not only did she tell us she was extremely happy with her new spa, this wonderful woman did a video for us to use. 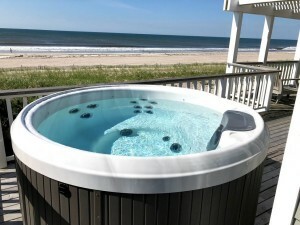 In it, Barbara praises Bullfrog’s warranty, terrific massage jets, that it’s so well made the elements at her oceanfront home will not cause it to rot or rust, that it boasts 90% less plumbing than other brands, and, ahem, she also has praises for our service at Best Hot Tubs. Barbara Corcoran had been looking forward to time spent in her hot tub with family and friends when her older portable spa went kaput. She wanted a new hot tub quickly, one that had the same shape as her old round model. 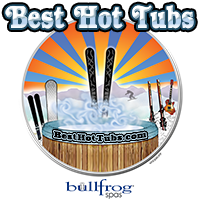 With a little checking, she found Best Hot Tubs had just the ticket — Bullfrog’s X6-R model — in stock, and she could have it immediately. After the electrician did the necessary hook up, Bill went back to make sure everything was working perfectly. Here’s an 11-second video of Bill’s test of her new Bullfrog Spa on Fire Island.